Rig everything. Choose the number of fingers, toes, add tails, hairs, ears, breasts. Pose manager. You can copy/paste/flip poses. InstantSkin. Skin your characters in seconds. Save your prototypes and don’t waste your time creating rigs from scratch everytime. Export to game engines. 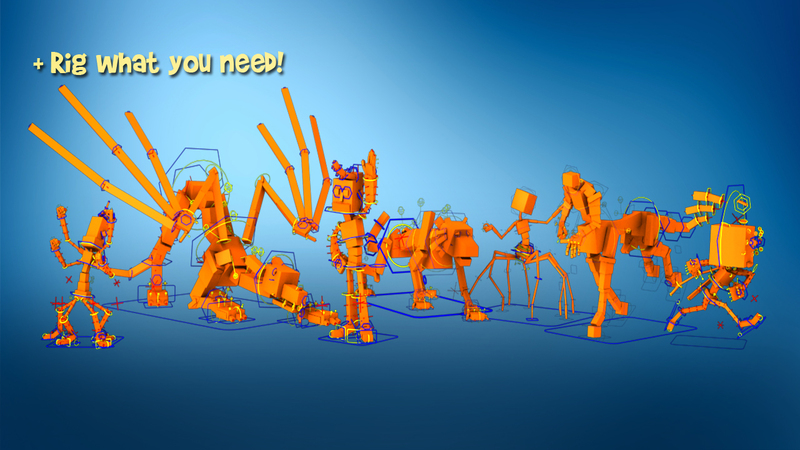 Bake your animations down to deform bones, without controllers, constraints etc. Easily export your characters to game engines. Auto overlapping action for all character controllers. Fully scalable. You can resize your character any time. Fully flexible. Stretchy and curvy spine, legs, arms. Soft IK. Protects knee and elbow from poping. Match and slide between IK/FK.